South Africa is a country located in the southernmost part of the continent of Africa. Best known for its mining activities, it not only boasts of the biggest economy in Africa but is amongst the most popular tourist destinations due to its rich cultural diversity and wildlife. It is not well-known for its culinary diversity but it should be. South Africa has one of the richest culinary traditions born out of life necessities and in part, brought in by Portuguese Indians and Dutch. The following overview of 10 South African foods you must eat before you die will better illustrate this. This is the official national dish of South Africa. Bobotie is a mild cape-Malay curry dish which features almonds, ground beef, sultanas and egg custard. Bobotie is most commonly served with pilaf rice, another popular dish in South Africa and sambal which contains chopped tomatoes, banana, nuts, chutney and a little bit of coconut. Bunny chow is another popular South African food, but it is of Durban origin. It basically entails a hollowed out half-loaf filled with delicacies. Some of the delicacies that are used in bunny chow include curry lamb, chicken or beef but in some instances, it can be vegetarian in nature. This dish is a favourite amongst the Afrikaners community of South Africa. Koeksisters can be basically regarded as candied vegetables and is usually made by drenching vegetables in fat and syrup and then deep-frying them. This is a traditional South African dish that is also native to many parts of Africa. Pap is made from ground corn and is highly similar to American grits. The ground corn is usually mixed with hot water and stirred to create a dense paste but this usually varies according to the preference of an individual. Pap comes in many variations, slap pap is a less dense version of pap and is usually runny in nature, stywe pap is a much denser version of pap and is more popular than slap pap while phutu pap is a slightly crumbly much denser version of pap. Pap is usually accompanied by meat or vegetable stew. Waterblommetjie is a vegetable stew made from some edible form of water lilies. The name is Afrikaans and it means ‘small water flower stew’. This stew is regarded as the best company for the pap and is usually spiced to enhance its flavour. Waterblommetjie is very popular in South Africa and as such, can be considered as one of the staple foods of South Africa. Mashonzha is a traditional dish of the Zulu people but also features prominently in the list of 10 South African foods you must eat before you die. Mashonzha is basically mopane worms: mopane worms look like caterpillars but are non-poisonous and as such, edible. These worms are usually fried or grilled and are a common sight in markets within South Africa. They are usually served with peanut or chili sauce to enhance their flavor. Frikkadels is another popular South African dish considered as a favourite by many people residing in South Africa. Frikkadels is in the category of a small-sized hamburger and meatball due to their peculiar size. They are generally regarded as snacks but also features in main meals. They often contain seasoning, the most common being coriander or nutmeg. 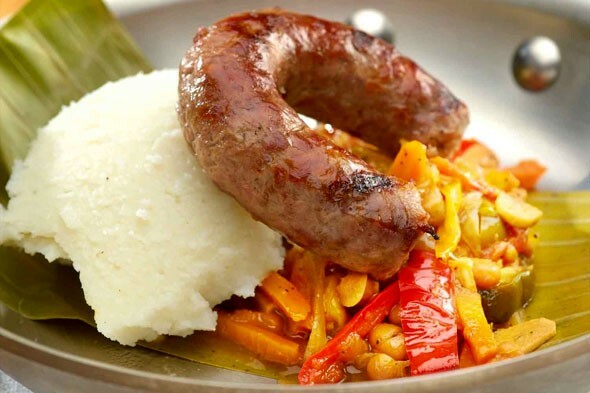 Droewors is a spiced sausage and can be generally regarded as a smaller, thinner version of boerewors but without the pork. They are usually sundried like biltong and have a longer shelf life when compared to boerewors.